AP: What were the pros and cons of being a flight attendant? PR: On private jets, right? You realize I was on private jets, right? PR: Okay, the benefits is, you’re getting paid a lot more. You’re waiting on only two, maybe 10 max, people. You’re staying in better hotels. You’re better taken care of. And you usually go to some amazing places. And you may sit there for a week while they’re on vacation, while you’re in that amazing place. The cons are, you never know where you’re going. You never know when they’re going to call. And the cleaning and the keeping up of the aircraft under the elements, if you don’t have a hangar and you’re in snow. And catering problems and agriculture and immigration problems – not immigration – agriculture problems, around the world, where they take your food and…unruly passengers, drunk passengers, spoiled rotten brat passengers, diva superstars, and demanding passengers. AP: What was it like working with divas and superstars? Was it a good thing or was it something that you didn’t necessarily like? PR: No, I loved it. And I was lucky enough to only fly, really only three nasty people. Maybe four. Out of the hundreds of people that I flew, I got really, really lucky. Most of them were like you and I would be. You know, we’re on a private jet. We’re not going to be in a bad mood, right? You know you’re gonna be happy, upbeat, fun. Positive. You know everybody is just happy to be there. They’re not on, you know, American Airlines being crammed together next to, you know, a big person. Usually everyone’s in a great mood. But occasionally, yeah, you get a diva. Diana Ross was a diva. Sylvester Stallone was a jerk. But then we had people like Rod Stewart that were wonderful. And Tom Cruise was great. And Lionel Ritchie was a blast. Dean Martin was hammered. Julie Andrews’ kids were the most well behaved children that I’ve ever seen in my life. I mean, you kind of get the gamut. What I did find was, it’s more of the rich that aren’t famous that are more of the pains in the neck than the famous. PR: Yeah, like the producers or whoever the heck they are, I don’t know. The publicists, The people that think that they’re important but I don’t know who they are. I know who Tom Cruise is, but I don’t know who you are. All I know is, you’re in the back of the plane, so you’re getting served last because that’s where you’re seated. Meaning you might get your food on descent, right? Because if it’s a short flight, that’s just how it goes. AP: So the celebrities act just like regular people, like yourself and I? PR: Exactly. They really, really are. They’re truly, they just want a meal, and a nap, or a glass of wine, or whatever, and to be left alone. But now the hard part is knowing who to leave alone and who to over-serve. Like Jack Nicholson, he liked to have attention. And so we gave it to him. He was, like, my favorite passenger. But somebody that’s doing, like, they’re having a sales meeting, and they’re going, let’s say, I don’t know…I’m going from Southern California to Panama, let’s just say. And if they’re having a meeting on the way down there, they don’t want you hanging around. They want their coffee refilled, and then they want you to go away. AP: How has this affected your personal life? Because obviously, in this industry you have to expect the unexpected. And you’re away from your family for extended periods of time. PR: It was hard. It was very, very difficult. I won’t lie. I didn’t realize that it was going to affect me as much as it did. My priorities were flying. It meant everything to me. I never turned down a trip, unless I already was booked on another airplane. But I did not have the chance to say…I lived with my fiancé, but I didn’t really know who he was because by the time things had a chance to deteriorate I was gone again. And so it left a lot of opportunity for him to do whatever he wanted while I was overseas, and I had no idea. So, that was a mistake. AP: Did he cheat on you? PR: Did he cheat? Yeah. He did. AP: Sorry to hear that. PR: No, that’s all right. That’s how you learn life lessons. I got an amazing son out of it, and it was like, the best thing that ever happened to me was having my son because he’s just such a great kid. And then I learned, you know, a big, fat lesson. AP: When you travel often, do weather conditions prevent you from flying? Do you have a fear of being on a private jet during storms? PR: (Laughing) No, I love turbulence. And there were times that we’d be so bored, we’d be flying the airplane back…okay, now, you have to imagine this was the ‘80s, and money was not an object, okay? Everybody had money in the early ‘80s. We would be bringing the airplane back from Asia with just myself and the two pilots, and I would do cartwheels down the aisles while they would go up and down (laugh) with the plane. And do handstands and stuff, just because we’d have to entertain ourselves because we have a six- or nine-hour flight to Anchorage, another six-hour flight down to Long Beach or wherever we were going. So we would do stupid, silly stuff like that. And I loved it. I love turbulence. Some passengers don’t, so you know, I used to make some of the drinks. One of my owner’s wife, I always made her drink stronger. We did hit a windshield once in Dallas. That did scare me, I have to say. That did scare me. Because it was like, we went vertically straight down 10,000 feet in, like, I don’t know, in like a minute. So what happened was, I was walking in front of these stock brokers and they had four glasses of wine. The wine flew straight up out of the glasses and right straight back down into them. In a nanosecond, like that. And I flew out of my shoes, hit my head on the headliner, and came right back down. PR: Yeah. And nobody was hurt, and it was fine. But it was bizarre. But it still didn’t scare me. AP: Did it feel like your life flashed before your eyes? PR: You know what? I was more worried about the wine spilling all over the stock brokers because that’s how conscientious I was. I never really thought about my own danger. AP: You have to be careful when flying. PR: I mean, I actually have never thought about my own danger. AP: Well you’re definitely a soldier because I know so many people that are afraid to fly. PR: Everybody hates it. I know. They have to take a pill or a shot of Jack Daniels or something. AP: Right. And I mean, obviously, when you’re flying on private jets, it does seem like there’s a greater risk of something happening versus flying commercial. PR: No, I think that’s opposite, and I’ll tell you why. They have a full time maintenance crew on each one of these airplanes. And you are not putting the CEO of XYZ Company on an airplane that hasn’t been through every single maintenance check to the, you know, cross the T’s and dot the I’s. Because you’ve got the CEO of, let’s say, I’m just making this up, Sony, onboard. Are you gonna let him go on a plane that’s not a hundred percent quite…if you’re the chief mechanic of that plane? PR: Yeah. So no, you’re safer in a private jet. In the old days you used to be able to go out on the ramp, on the tarmac. Like I would drive right up to the plane and unload my groceries and stuff right up the stairs. But nowadays because of the security, you can’t really go onto the tarmac anymore, which, that would be my only thing with private jets is, is that somebody could get to the jet itself and do something with it. But even, some of the companies have security guards that go through everything before they get off. And they fly with us. PR: And they’ll go through the whole trip before the actual CEO and the CFO, whoever’s on the plane, do the trip, those people will go ahead. And they check out all their rooms, and everywhere they’re going, and make sure that it’s security approved. AP: Especially since the 9/11 attacks, you have to increase security and take extreme measures to make sure. AP: How did things change after 9/11? PR: After 9/11, it didn’t really change the private jet industry that much…Except for the tarmac, they did change the tarmac rules where you couldn’t…I could drive my car up there at some places, but only if I could get in the gate, which you needed a badge to do. So like if I was full time, even if I wasn’t a full time employee, but they knew me well enough to give me a badge, then I could get in, then I could drive up to the plane. But without that badge you can’t get in. But for private jets it didn’t really change, except for when we went to training. Some of the companies did more security training and would hire out private enterprises, survival companies and whatnot to show us other stuff to look for. You know like if somebody wanted to come on board and jump on board the plane when we’re sitting, while they’re in, let’s say we’re in Texas and they’re in a meeting, and you’ve got four hours to kill, and I’m sitting on the plane reading my book, the pilots go to get something to eat, and then I leave the plane. Well do I leave the door open, or do we put our little sign out? You know, that kind of stuff was changed. AP: What advice would you give to anyone who’s afraid to fly? Because, myself, for example. PR: I would tell them to fly in the jump seat between the two pilots. Because they’ll explain it to you. Number One, there’s three ways to do everything on an airplane. So if one system fails, there’s a second system. If the second system fails, there’s a third system. That’s what puts out all those, like there’s three…in a commercial jet there’s three…depending on the size of the engine there are the three lights from, I mean, the fire extinguishers in there. So there’s the chance for the fire to go out if it catches on fire three times. The same with all the hydraulics and the computers and the radar and everything else. Now the other thing you’d want to mention with that would be, once you see how something works, and it’s explained to you, you’re not as terrified because you understand how the law of gravity works when you’re going against it. So when you’re taking off against the wind, when the pilots explain it to you, it will make sense. And then you’re not scared because you see that you’re actually in really capable hands. AP: Realistically speaking, what are the chances of an airplane crashing? PR: Um, it’s less now than it ever has been in our lifetime. It’s getting lesser every day because of all the backup systems, and all the maintenance checks that are required. You know every hundred hours, every airplane has to go through a maintenance check. And then some of them have to be completely torn apart and then put all the way back together again, depending on how old they are. You’re much safer in an airplane than you are crossing the street. Or by far safer than driving in a car. AP: So tell us about some of your current projects that you have in the works? 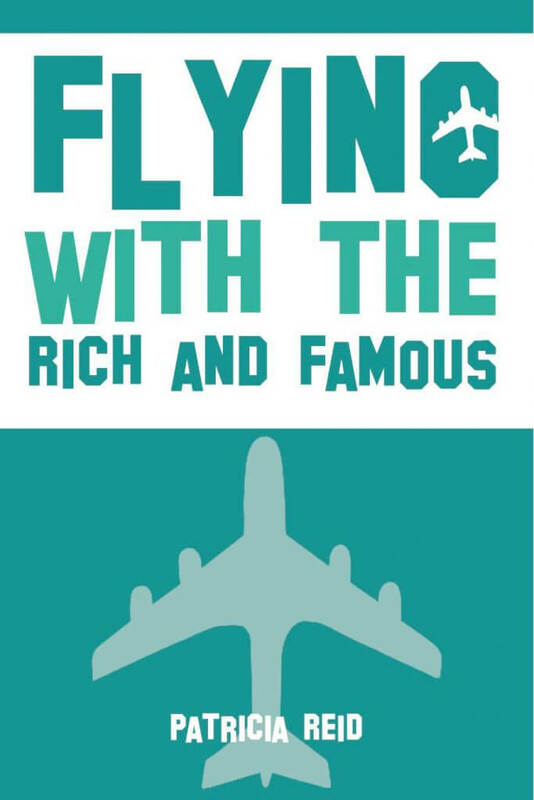 PR: Flying with the Rich and Famous is my book. And it’s on Amazon. It’s on Facebook, and you know, Twitter, Instagram, Pinterest, and Google Plus and all the rest. It’s kind of my memoir, it’s not kind of; it is my memoir. It’s all true stories. I did name names. I told the truth. It’s kind of funny, because I have a little bit of a wild sense of humor and, it was a fun job, so I told the truth. And I would like to see that get made into a movie. AP: It sounds like it would be an interesting movie that would have people on the edge of their seats, just waiting to see what’s going to happen next. So I’m definitely rooting for you. PR: Yeah. Well see, you never know. But it is selling really well. It’s been out since August and it’s doing really well. I’m still holding under “Autobiographies of Rich and Famous,” I’m anywhere between three and 12 on any given day. PR: Thank you. It’s been great. It’s been fun. But I’ll probably go back to flying soon because I’m starting to get that grounded feeling, but, not until my son goes to college, and he’s leaving in August. AP: That’s right around the corner. PR: Yeah, exactly. So I’ll probably end up back in the air because that’s what I like to do. AP: You mentioned something that I found quite interesting. You said that you mention names in your book. Do you think it was a good idea to mention the names of the individuals that you had bad experiences with during your time as flight attendant? PR: I didn’t say anything that most people in Hollywood don’t already know. Most people are aware that Sylvester Stallone is an idiot. In fact I had one flight attendant from a company in Burbank who Facebook messaged me and said, “Boy you were really nice about Sylvester Stallone.” Because he’s that much of a jerk. And I told everybody in the book that he was, you know, not very nice to us. And Dean Martin, yeah, we all knew he was a drunk and he was wasted, so I told the truth. Lionel Richie was after one of the flight attendants and, yeah, we all know that he cheated on his wife. So I don’t think it’s anything anybody’s going to care about. If they do, they can sue me. But they’re not going to because everybody knows it’s true. PR: Rod Stewart was a blast. Larry Flynt was a goon. You know, they’re all the same stories. Dionne Warwick was lovely. You know…Elizabeth Taylor was the most stunning, most classy lady I’ve ever flown in my life. So, most of it, like I said, is kind, and if they don’t like it, they, let them sue me. I don’t care. AP: Well, at least you’re upfront about it. PR: Yeah. No, I don’t really care. It doesn’t matter to me, because, you know I didn’t make anything up. AP: Right. Most of the time we only see the glitz and glamour of Hollywood. It’s rare that we see or get the truth about what really goes down in Hollywood. PR: Well here’s what I say, “When no one’s watching but the flight attendant.” See, that’s, when they get on that plane, they let their hair down. And that’s why I wrote the book. Because I’m the only one that sees them like that. AP: Your book is doing extremely well. Can we expect a follow-up in the future? PR: Um, I don’t know, unless I turn it into a fictional book. Because it would make a great fictional story. Because you could just take all those stories and just go hog wild with them. But, I don’t know if that is something that I’ll do.